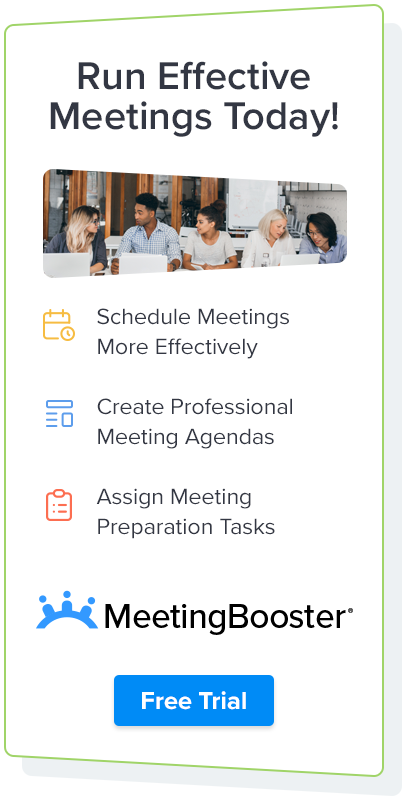 By consolidating notes and automatically generating and distributing accurate meeting minutes, MeetingBooster adds value to meetings by improving decision making, increasing transparency and turning ideas into action. Consolidating notes and formatting meeting minutes can be tedious and time-consuming. 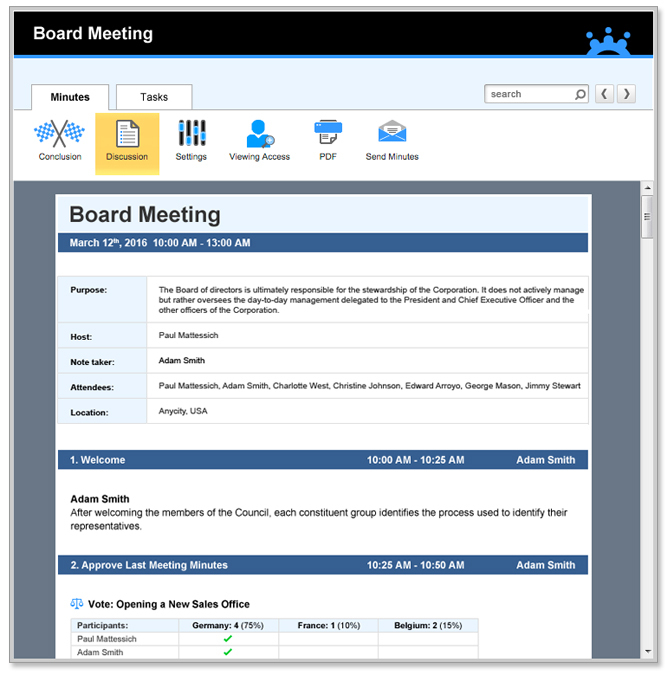 MeetingBooster's Meeting Minutes tool automatically converts the notes, conclusions, task assignments and other information taken during the meeting into a professionally formatted meeting minutes document. Choose from various layouts and view minutes as detailed discussions or view conclusions only. Meeting minutes should be readily accessible to attendees and relevant management, but with many employees working remotely and company intranet sites like SharePoint becoming increasingly cumbersome, accessibility can pose a serious challenge. MeetingBooster's automated distribution system automatically sends a professionally formatted PDF minutes document containing the meeting notes, conclusions, tools and tasks to all designated attendees. Attendees can also log into their MeetingBooster account to view meeting minutes. Archiving meeting minutes can be complicated and requires discipline. 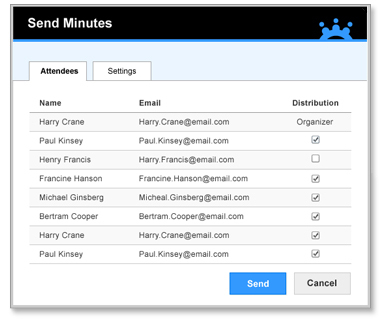 Locating and reviewing meeting minutes can be tedious when using a company intranet or when emailing back and forth. 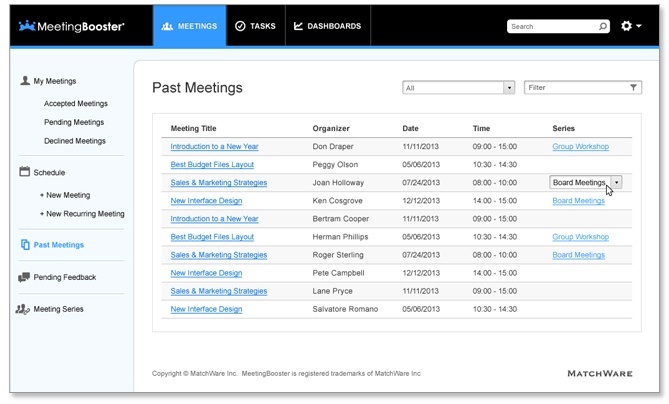 MeetingBooster's meeting management system stores all meeting minutes online, archiving them by meeting title and date, making them accessible to anyone with viewing permission. Users can also search across several meeting minutes’ documents to find discussions and merge search results into a consolidated document. This makes the review process less time-consuming and more reliable. Meeting minutes often contain sensitive information, so it is critically important that access be limited to authorized users. MeetingBooster was designed with security in mind, allowing access only to those who have been invited or have permission to view specific files. This means that sensitive information is securely archived and remains secure at all times. 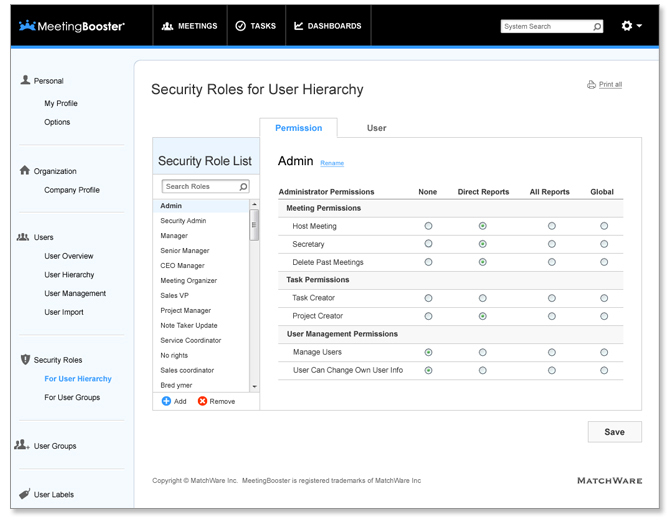 MeetingBooster includes a User Hierarchy and User Groups feature which allows efficient deployment of permissions. Request a MeetingBooster Trial Account!